It’s too abstract. I had to look at it for awhile. I don’t feel most people would realize what it was at all. Yeah, I’m not really feeling this one. 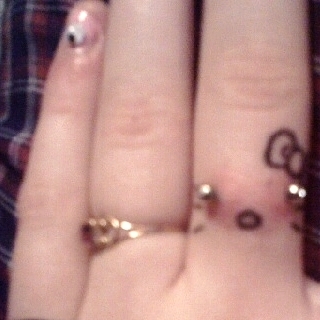 Fingers dont seem like a great thing to pierce, but if you were to do it then i’d hope it would look better than this. I mean if you’re going to pierce your finger for HK at least have the art work done more creative and colorful. This is just too simple considering the idea that was formed for it. I can appreciate the idea, but she didn’t complete on the deliveryty. First, where’s the outline of HK’s head? Second, I agree w/Sprinkle919, the finger certainly isn’t the best placement for this type of tattoo/piercing. I’d love to see HK in color but of course thats a personal choice. I think that if this was done on the hip, it would look really cool. I know several tattoo/piercing artist who will not tattoo faces or hands, or pierce hands. This only confirms that they are right! It actually kind of looks like she got her finger pierced then drew the rest around it it black marker and then forgot what she was doing. This person needs a psychologist visit. I am pierced in some pretty sensitive areas and even I wouldn’t dream of doing something this stupid or ugly.